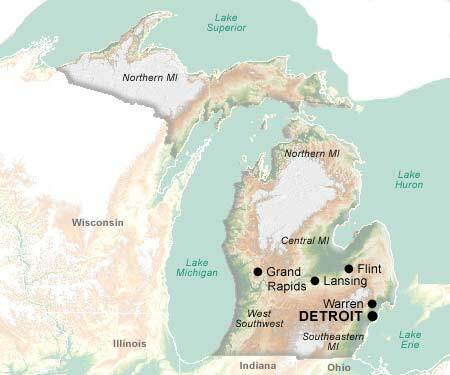 Michigan is surrounded on three sides by four Great Lakes: [le], [lh] [lm], and [ls]. The unique configuration of Michigan's Northern Region is a narrow connection between the Lower Peninsula and the Upper Peninsula which, geographically, is closer to Wisconsin than Michigan. Known as the Great Lakes State or Wolverine State, the name Michigan is derived from the Indian words "Michi-gama" meaning "large lake". Michigan was admitted to the Union in 1837 as the 26th state. Natives of Michigan respond equally to the appellations Michiganian or Michigander, but not all with equal grace. Michigan's capital is Lansing, in the Central Region, and Detroit in the Southeast Region is the largest city as well as the center for the country's automobile industry. Other major cities include Grand Rapids, Flint, and Warren. A few of the prominent figures who were born here include: industrialist Henry Ford, aviator Charles Lindbergh, statesman Ralph Bunche, sports figures Magic Johnson and Ring Lardner, and entertainment figures Ellen Burstyn, Francis Ford Coppola, Stevie Wonder, Madonna, Della Reese, Diana Ross, Steven Seagal, Tom Selleck, Lily Tomlin, Danny Thomas, and Margaret Whiting.